We all know that there is much more to a person than what is on the surface. This is why there are many sayings and maxims that exhort us not to judge a book by its cover and so on and so forth. However, trying to perceive what is hidden deep beneath the surface takes more time than most people can possibly have to spare. It is also not practical to do this with a large number of business associates and acquaintances. When you meet a person at a networking event for the first time — his or her brain and senses almost instantly formulate a string of emotions and thoughts that help dictate how they will perceive YOU. Are you “important”? Are you interesting, creative, outgoing, or stationary? Are you worth it? Strings of thoughts based on your appearance are formulated within seconds — the best chance you have at steering a person’s perception toward a certain outlook is by being prepared beforehand. This is an important life lesson to take note of. No matter how good you are on the inside, it will not help you go very far if you can’t make not just a positive impression, but an inspiring one. Then again, some people try to hard — accidentally creating an image that shouts desperation and incompetence. The easiest way to make a bad impression on everyone without lifting a finger is to forget all the good grooming techniques that you were most likely taught when you were growing up. 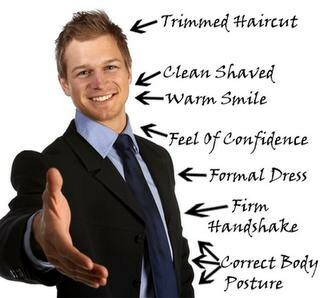 If you weren’t lucky enough to have been taught those techniques, I suggest you type “Business Casual” into Google search, and check here if you are a bloke or here if you are a female. When you step into a room or a party wearing clean and smartly ironed clothes that do not look shabby or too old for wear, you will immediately earn brownie points with everyone in the room. People will not outwardly or consciously recognize your good grooming, but this fact will be registered in their subconscious, and they will be warmer towards you than if you had stepped in looking like you didn’t care — at all. Desperation will kill any hopes you have of networking successfully. People like to be inspired, to be impressed, and to see people that take initiative. In reality though, someone wearing a nicely tailored suit, but with a frown, isn’t going to attract too many new connections. Even so, a networking event is like any other social event — people don’t base their first impressions of you on just your fashion sense, but also your body language and attitude. 1. Warmth. Attitudes are sensed instantly. If you are open to meeting new people, you will give off the feeling — if you aren’t open to it, besides a networking event not being your best fit at that moment, the atmosphere around you may be cold and or tense. 2. Smile. Before you greet someone, briefly think about a situation that made you truly happy (best to have this ready early on) so that you begin a conversation with the attitude you want to embody. 3. Eye contact. What was the eye color of the last person you met at an event? Well, remembering isn’t what you need to do (unless you want to), but noticing what a person’s eye color is may help you look directly into their eyes. To many, this can not only portray strength and focus, but in the traditional sense, professionalism and or maturity. 4. Shake Hands. Hand shaking is a tradition for a reason — it promotes physical touch, which in place promotes warmth, friendliness, and a much more likely to be remembered impression. 5. Personal Space. I can’t tell you how many times I have met people at events, looking for jobs or way to connect, and the first thing they do is insert their face and body in a space only inches from my own. No, no, and NO. Personal space isn’t a myth — people have boundaries, and as people become more acquainted and comfortable with each other, their relative personal space decreases. Understanding this and using this to your advantage by being not too far, but not too close to a person can display respect. Originally published at https://www.linkedin.com on August 27, 2014.